Gizmo showing off his bright blue tags. Last night, our neighbors found two Golden Retrievers in our neighborhood who were wearing bandannas, but no identification or real collars. Both dogs were friendly, well-fed, and well-groomed, so they were obviously a pair of lost pets. To keep the dogs safe and contained, we closed them in our garage while we started to look for the owners. This story has a happy ending, as it took less than an hour of asking around the neighborhood to locate the missing family, but not all lost pets are so lucky. In the case of exotic pets like Gizmo, having a plain, easy-to-see identification on them is even more important than it is for dogs and cats. If someone sees a cat or a dog in their backyard, their first impulse is "lost pet." If someone sees a fox, raccoon, or skunk, their first impulse is "wild animal". If your pet dog gets out, most folks will try and catch it and return it to you. If your pet fox or pet skunk gets out, they're more likely to call animal control. This is one of the situations where having a friendly pet fox can make the situation worse, if they're not wearing a collar or harness. Most wild animals will not approach a human unless they are sick. 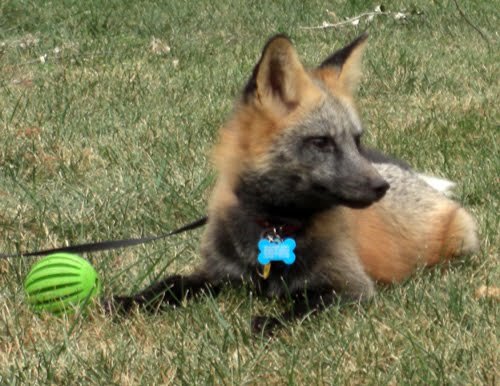 A lost pet fox trotting up for an ear-rub might get shot by a wildlife official, simply because it's not behaving "normally" for it's species. And with no obvious identification, how can we expect them to know it's a pet? Gizmo wears harnesses in bright colors--usually red, blue, or green, to stand out against his butterscotch-and-black coat. The more obnoxious the shade, the more I like it. I want it to be obvious from space that he's a pet. He wears many identification tags, and is micro-chipped. (However, micro-chipping alone is not an effective way of getting your pet fox back--without any external means of seeing it's a pet, they've got no reason to check for a chip). Some people choose not to keep collars on their pets due to fur-wear. Nylon collars can cause the guard hairs around the neck area to break off, leaving a woolly texture instead of a sleek one. Snug-fitting collars in animals with long or curly coats, like a Persian cat or a poodle, can cause issues with matting up the hair under them. Although fur-wear is a minor cosmetic inconvenience, matting can be difficult to groom out, and can be painful for the animal. One solution that we've found works very well, both against fur-wear and against matting, is to use what's called a rolled leather collar . They don't flatten the fur under it like a nylon or flat leather collar does, and we've had great luck using them both on Gizmo and our shaggy mess of a dog. (Our dog is a Bouvier de Flandres, which have thick, woolly, curly coats). They are a bit more expensive than traditional flat collars, and can be hard to find, but they're long-lasting and worth the price. Gizmo is hard on his things (I'm constantly having to buy new harnesses for him) and it took him almost two years to wear out the collar to the point where I had to replace it. Our dog is still on her first collar. Unfortunately, there don't seem to be any break-away rolled collars for cats. At least, none that I've found (if any of you come across one, please let me know!) For our long-haired cat, Kali, an effective way to avoid collar-matting is frequently removing and grooming the hair under the collar, and keeping the hair around her neck clipped short. A bit of a hassle, but it's worth it for her safety. Another reason I hear quite a bit for why people don't put collars on their pets (particularly cats and pet foxes) is that the pet "won't wear it". This is actually a pretty easy problem to fix, but it does take a bit of thought and work. When you first buy the collar, wash it thoroughly, and wear it around your arm or ankle for about a week. This helps to soften the collar up so it will be more comfortable, and replaces the "alien" smells of the store with the more familiar smells of you and your home. Having a bag of treats or a toy ready, put the collar on your cat or pet fox. Leave it on for about five minutes, and have an intense "love the pet" session. Treats, toys, ear-rubs, belly-rubs, whatever your pet likes best. Then take the collar off and ignore them for the next half an hour. Refuse to give them attention of any kind. Put the collar back on, this time for about ten minutes, and once again shower them with love and praise and treats. Once you take it off, again break off all praise, treats, affection, etc. Rinse repeat. Each time, increase the amount of time that you leave the collar on. If you feed your pet meals instead of free-range, put the collar on and have them wear it while they eat their dinner. The whole goal behind all of this is to make them associate the collar with good things. After a day or two of this, even the most stubborn of cats will probably be wearing the collar with no problem! Foxes can take a bit longer to acclimate to it, but with patience and persistence will also learn to wear it no problem. Those two goldens wouldn't happen to be my neighbor's dogs, Charlie and Jackson, would they? Nah, they came from the next street down towards the library. I'll have to try this to see if I can get my cat to wear a collar. Never had much luck before. If the cat still refuses to wear the collar, I have a couple other tricks you can try. I have two cats, and got them both used to wearing collars in no time when they had never worn them a day in their lives previously. The way I did it was, the second they came home with me on adoption day, the collars got put on. The theory that was agreed all around was that coming home was a major shift in routine already, so such changes were to be expected. I use the normal collars sold at pet stores, and I guess I'm lucky, because my long haired cat has never had any problems with it; it just kind of creates a part in his hair, and it goes to either side of the material. What was more of a problem was harnesses; I needed them because I live on the fifteenth floor, and during a fire alarm or emergency situation I wanted a way to grab them quick. My boys are large, so the standard cat harness is too big, so I used a small dog harness instead. The problem was that dogs are built differently and the strap across the bottom restricted their legs; my one boy, the drama queen, would flop over in rebellion and not move for anything, even food. The compromise was not hooking that strap, and they haven't complained once or ever slipped it. TBH, food was way more of an issue than collars ever were; they came from the shelter pretty overweight from always having food available in their bowls, so they were put on a strict twice a day, measured portions feeding routine. Getting them used to eating their entire bowl in one go was a little difficult; at first, I took it away when they left it and didn't give them anything until next meal. They got it really quick, but boy can they be annoying about when dinner is coming now, lol. Perhaps the collar trick will help me finally get a collar on my obnoxious ferret >_> then again, perhaps not. He's so slinky the collars just slide straight off and then he ferret dances with them just to show that he's uncollarable. Those collars for cats you said about, well where I live their in like every pet store. My cat doesn't have an issue with collars...My mom does. When he was a kitten he used to wear a little black collar with a bell. One day I heard my mom screaming and when I arrived at the scene my cat's bottom jaw was stuck under the collar. I managed to get the collar off and not surprisingly he was afraid of it. He's 9 years now and occasionally I'll use one of my collars on him. He purrs and walks around like whatever. But my mom always has a fit thinking he will gag himself again. I'm wondering if it was because the collar was too loose? Any suggestions would be appreciated. Yes, this can happen with a too-lose collar. (In fact, I once had this exact issue happen with Gizmo and a harness when the neck loop wasn't on tight enough). The odds of this happening with a snug-fitting collar are very low, and it is likely that your cat learned his lesson the first time he got his jaw caught under it. *sigh* not really lol. It happened a second time but this time it was much easier to get it off of him. And he didn't flail as much. I can put a nice little scarf on him he doesn't mind. Thank you for the suggestion! I'm also looking into obtaining a fox but I'm far from it.